In the middle of summer, on a Sunday with reasonable temperatures compared to the hot days of June, we gathered again for a Food not Bombs, action that becomes more of a routine (in a good way) both for us and for the people that come to eat. Everything is happening better and better and the entire action comes out beautifully. We’re actually getting quite good at it. In the shade of the trees behind the Republica Cinema, on Sunday, July 1st, we set our tables and started a new day of Food not Bombs. Everything seems to flow in a cursive manner; everyone is more relaxed and casual. Of course, there are always the occasional overweight people that pass with a disapproving look on their face, whispering to themselves: “But what is this nonsense? What’s happening here?”, but we treated them with the same attitude oriented towards informing, giving them a flyer and explaining what and why are we doing it, and they would soon disappear as they did not quite approve of our initiative. The Sunday meal contained many light, delicious, summer dishes that would be appropriate considering the sun and the heat. We had potato goulash, mushrooms, peas, rice, vegetarian recipes, tomato and cucumber salad, and for refreshments, a big fruit salad and a sour cherry compote. As desert, we had pancakes with different fillings, biscuits and candy. Everyone enjoyed the atmosphere. The children played with tennis balls, drew on the pavement, learned new games and even learned how to make some origami birds and boats, learned how to ride a bicycle, ran, posed and had a good time in our company. Everyone seems to be more communicative, and we like to think that we gave them at least a bit more self confidence. Food not bombs is becoming more then just a simple event of distributing food and protesting against war and poverty, gaining a happening valence. Games, healthy food, good will, drawings on the pavement, photos, and a lot of socializing once a month in the park behind the Republica Cinema. We hope that with each edition, more and more people will get involved, because together we can change the world, or at least we can try, we can raise our fists and we can say that poverty and war are NOT ok, that hunger is NOT something normal as long as the money spent every week in the whole world on guns would be enough to feed the population of the whole globe for a year. We can stand up and fight back! 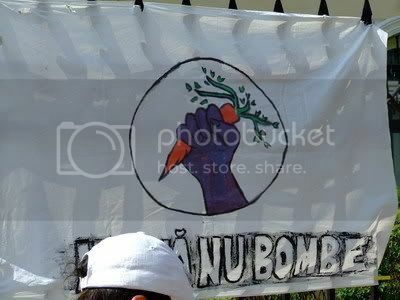 FOOD NOT BOMBS! Food without borders!